To carry a concealed handgun on your person legally in Tennessee you’ll need a valid handgun carry permit. However, as part of the expanded “castle doctrine” it is legal for anyone who can legally own a firearm, be it a handgun, rifle, or shotgun to carry that firearm in their vehicle and that firearm can be loaded or unloaded. However, as I understand the law if you don’t have a valid handgun carry permit then you cannot have the firearm on your person i.e. in a holster on your side or in your pocket. Also, if you don’t have a valid handgun carry permit then it is illegal to remove that firearm from inside your vehicle. As with all laws, things can get tricky when it comes to understanding firearms laws and it’s easy to break a law or two without even knowing it so take anything that I saw regarding the law as just my opinion and then do your own research, because well, I’m not your lawyer, hell, I’m not even A lawyer. Even though carrying a loaded rifle or shotgun inside a vehicle in Tennessee is legal most of the time I don’t carry one or the other because I don’t feel that it’s necessary during my everyday routine. Plus, if it’s spotted inside the vehicle by thieves (yes, we have some of those here in Tennessee) when the vehicle is left unattended for some reason then it becomes a tempting target for those thieves who notice it. My truck windows are tinted, and it’s difficult to look inside without putting your face really close to the window and looking in so anyone including thieves would most likely pass right by my truck and never spot the firearm inside when secured behind the seat with the Snap Rack, but as an extra precaution I always toss a shirt or jacket over the headrest and let it hang down and cover the firearm. So, as stated because I feel it’s necessary most of the time and because of the possibility of theft, I generally don’t carry a rifle or shotgun inside my truck during my day-to-day activities, however, there are times when I do such as when I’m out driving the backroads and or taking a ride through the mountains. It might be that I’ve watched “deliverance” to many times or could it be “wrong turn”… no matter, I feel safer with a little extra firepower close by and that extra firepower is usually an AR-15 held in place behind the passenger seat with the LUCID Snap Rack. The Snap Rack is an incredibly simple yet effective vehicle firearm storage system. Now with the Snap Rack your firearms can be safely and securely stored in your vehicle and be easier to access than ever before. 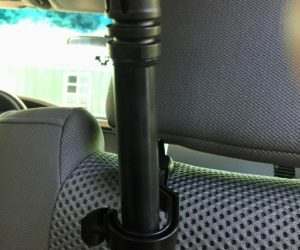 The Snap Rack works with the natural laws of gravity and the posts on the back headrest of your vehicle where the firearm is placed in a vertical “muzzle up” orientation. When the firearm is needed, simply grasp the barrel and snap the rack off with one hand. It’s that simple. The Snap Rack is easy to install in about ten minutes and holds my AR-15 or Ruger 10/22 securely in place while leaving it quickly accessible from the driver’s side of the vehicle just reach over with your right hand an unsnap with your thumb while grasping the barrel with your hand and pull in up and across your lap and into action. It’s also great when going hunting and you have to drive 4×4 trails before getting to your hunting blind or stand. You never know when you’re going to be headed to your blind or stand and that big 12-point buck is going to show up before you get there. What I’m talking about is when you’re already in a legal hunting area and driving up an old logging road or similar route towards your blind or tree stand and not on a county or state highway. There is a big difference between the two. Here is an overview of the law in Tennessee… so, to keep it legal, even out in the forest in a 4X4 you’ll need to stop and exit the vehicle and be on foot before taking the shot. However, like I said before I’m not a lawyer, and the laws can get confusing, but that’s the way I understand it. As always, don’t take my opinion as legal advice… go talk to a lawyer or game warden for clarification of the laws. The LUCID Snap Rack is so simple yet safe and effective when I first saw it my feeling were mixed but after using it for a couple of years now I’m really impressed. My one regret is that I wasn’t the one who invented it! Recommended! Now this is a solid product! That is very cool. No more gun racks in the back window with this one. Btw M.D. ; nice clean nail.